Spruce up your lawn and garden with DIY backyard patio inspiration for revamps on your backyard patio. Is your patio primed for the summer season? Does it need a touch up so you can host the ultimate backyard party? Follow our DIY guide to create a backyard patio table or spiff up an existing one. The best part of a patio makeover is that it doesn’t have to be expensive. Instead, it’s about repurposing the old and unexpected to bring life to a place everyone loves to relax. From tomato cages to customized seat cushions, we’ll show you how to freshen up your patio spread for a minimal amount of money. 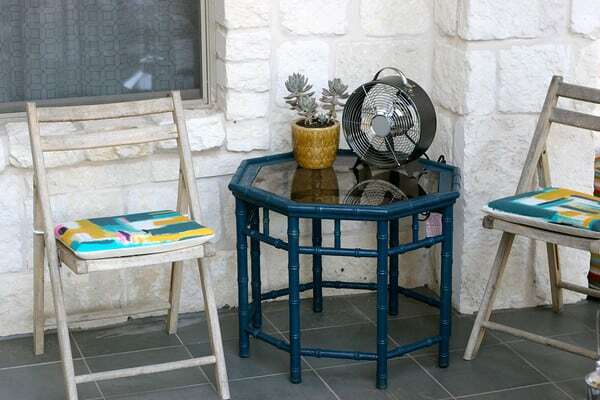 Take supplies from your lawn and garden, and create an authentic DIY side table for your patio. It is effortless and an amazing way to spend your summer nights outside with friends and family grilling in the backyard. 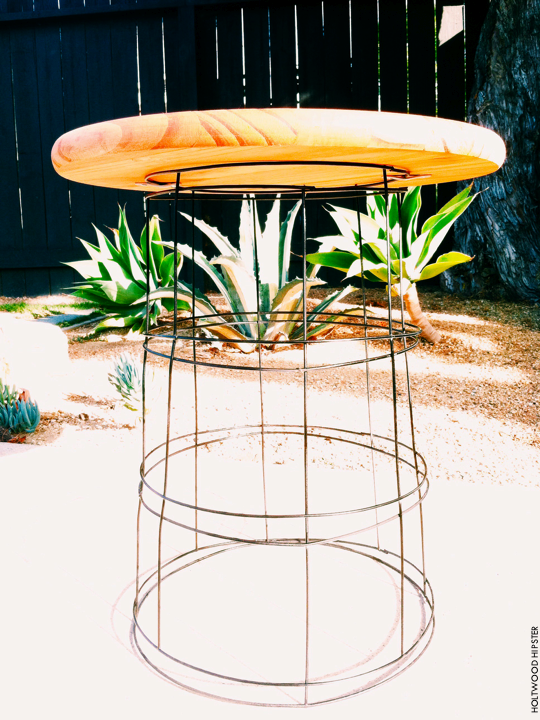 It’s easy to achieve a rustic, yet modern, look in your backyard this summer with this patio side table. DIY wire patios are rugged and easy to build. refurbishing and building a backyard patio table is simple with these instructions. 1.Turn both tomato cages upside down and, using a wire cutter remove the prongs of the cage just above the smallest and last ring. 2.Take both cages and stack them onto each other. This will create a solid base on which to place your round wood top. 3.Use the mending plates to affix the smallest, top ring of the tomato cage to the wooden top of the table. Note: Any painting or staining of either the wire cages or tabletop should be done before you begin construction. When you’re done, you’ll have a fabulous side table to accent your existing patio furniture. Take your old patio table from tired and drab to bright and ready for the summer. Sometimes the only thing an old table needs is a fresh coat of paint. We suggest a neutral color. With a plain color as a base, you can get fun, brightly colored chairs and accessories without having to worry about them overwhelming your patio color scheme, which leads to our next recommendation. The biggest way to accessorize your table is with chairs. Get rid of those old mildewed cushions no one wants to sit on anymore. Buy some new white ones and paint them into something stunning. Start by painting the fabric with matte gel as a base. Once the base has dried, start painting with your favorite acrylic colors and create some bold accents. After you’ve finished your design, apply another layer of matte gel to seal in the colors. We also think water coloring your cushions is a simple and expressive way to take patio furniture design into your own hands. As for table accents, we suggest a few eclectic table lanterns and an oil lamp. Make your own oil lamp at out of a wine bottle. Dishware and placemats can be purchased to compliment your new seat cushion colors. The centerpiece of any summer patio table is the flower arrangement. It’s not a table at a wedding, so skip the highly arranged and carefully pruned arrangements from the flower store and grab some from your own backyard. If they’re loosely arranged they’re the perfect kind of lovely for your backyard. From tables to cushions to paint jobs, you and your guests will enjoy the backyard like you never have before. This summer, the ultimate patio is just a few fun weekend projects away.